For some projects match the correct gauge can make the difference of producing an item that you love or despise. When I first started crocheting I would see the gauge section and think, “Ugh…do I have to?” but as I got more into crochet the more I actually enjoyed swatching for gauge. 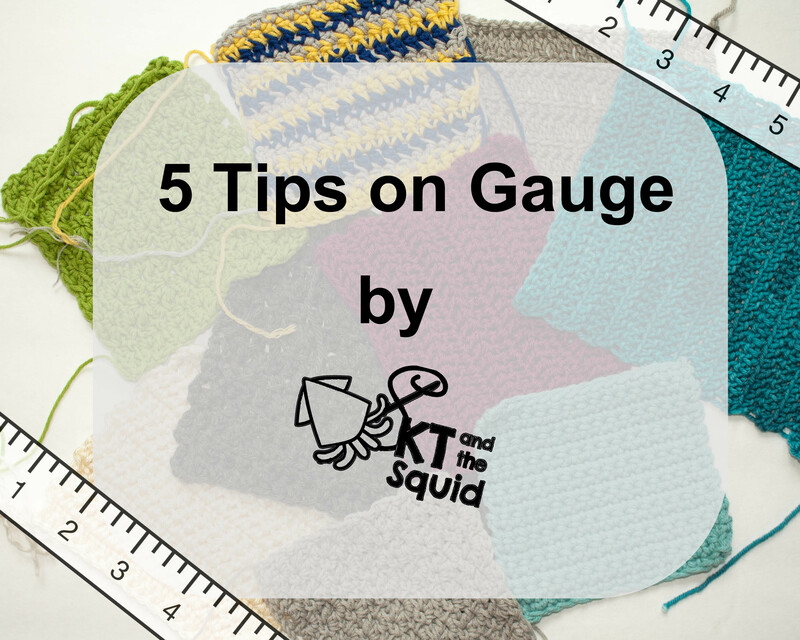 Here are 5 tips for a more successful gauge experience. 1. Make sure you have the right tools. As with most projects having the right tools will set you up for success. Appropriate yarn: If you’re making a substitution choose wisely based on fiber content and yarn weight. You might want t think about actually purchasing an extra ball just for swatching. If you have to make a few swatches you may need the extra yarn. Appropriate hook: Start with the hook listed in your pattern (not the one on your yarn label). Have other hooks ready in case you need to go up or down a hook size. Tape measure: I like to use a rigid ruler if I can and be sure to measure on a flat surface. 2. Keep an even tension. As your working you swatch relax and try to keep your tension as even as possible. This can be tricky at first but you want to use a tension that is natural to you. Once your done with your gauge swatch you want to make sure you keep that same tension while working your project. So if you pull too tight while swatching, it will be difficult to keep that up throughout the entire project. 3. Make your swatch slightly larger. It’s important to make your swatch larger than the gauge you’re measuring. So if it’s a 4″ square you’ll want to make about a 6″ square. When you measure your stitches you want to makes sure you have enough room to not only measure in a few different places (in case your tension was not even) but you also want to make sure NOT to measure your edge stitches. I can not stress this enough. Ever made a top that was absolutely perfect only to have it down to your knees in a month? No, you didn’t shrink. Your stitches stretched and relaxed which made your top grow. When you block your swatch you account for this growth. How you block will depend on the yarn you use so read your label. Blocking your swatch is also great practice for blocking your finished item. Here are some blocking tools I like to use. Stainless steel pins: I’ve been using Knit Blockers for about a week and am loving them. I’ll have a full review up soon! Blocking board: I like this little one by Crochet Dude. It’s the perfect size for gauge swatches and the lines help you pin the swatch out nice a square. Wool wash such as Eucalan or Soak . I keep a big bottle of Eualan Wrapture in Jasmine around. It smells really nice 🙂 You can get little sample sizes for pretty cheap to try the scents out. A garment steamer or an iron with a steam setting. 5. Learn to adjust your stitch height. This is a more advanced skill to have but it comes in very handy. I’ve said it several times, each crocheter’s tension can be as personal as their handwriting. So what do you do when your tension just does NOT match the tension of the pattern? It seems like an impossible task but it can be done if you train yourself to adjust the height of your stitches. This is also where extra yarn and #2 on the list will come in handy. First you need to find the hook that will give you the correct number of stitches in your natural tension. Then, if your stitches are too short you need to add height. To do this just pull up a bit more yarn after inserting your hook to begin each stitch. If your stitches are too tall you will need to tug a bit on your yarn (to make it tighter) after inserting your hook to start a new stitch. It takes a a lot of practice but once you master this skill you’ll be a gauge master!